Last Wednesday night (or it may have been Thursday), my wife Jenna made an after-work pit stop at Target and brought home three of those hangar boxes containing our first glorious baseball cards of 2018. My two sons and I anxiously opened our boxes in search of this year's First Phillie. 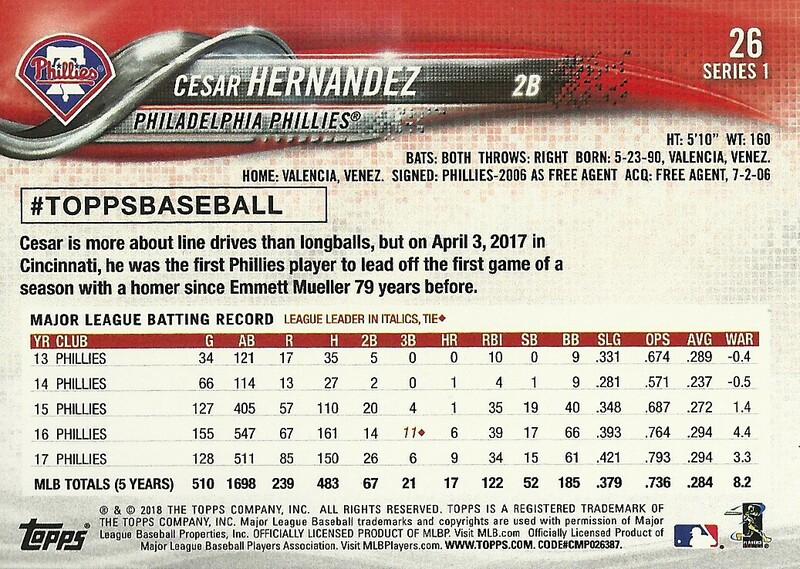 The search ended immediately as this Cesar Hernandez card was atop the stack from my hanger box, right behind the clear wrapper. My first impression of the 2018 Topps cards is that I like them a lot more than the 2017 Topps cards. I really didn't like the blocky lines cluttering up the 2017 Topps design and the skewed team logo bugged me too. This year the skewed logo is replaced by a non-skewed logo now riding a team color-coded wave. 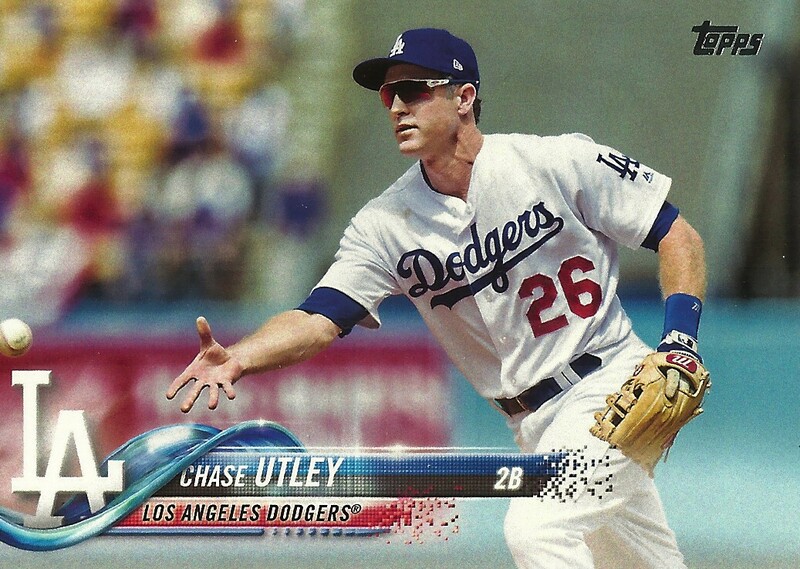 The 2018 Topps design has gradients, bursts of light appearing throughout the bottom design and a trail of pixels as the name and team banners dissolve off the side. I bought less packs of Topps flagship last year than perhaps any other year before, and my flagship pack buying might see a slight uptick this year. 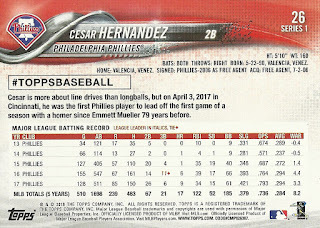 I don't mind the full bleed photos as much as other collectors, but I do wish Topps would simplify the overall design of their flagship cards a little. The backs are pretty much a repeat of last year. Full career statistics are still gone and the player's social media accounts are presented, if that player has any social media accounts. If not, there's just a rectangle box with #TOPPSBASEBALL in it. Our oldest son Doug (11) thought the cards were cool, but they're not his favorites. In a stunning development, our youngest son Ben (7) announced that he'd be collecting the set this year and he immediately started putting his cards in order. I think he lost some steam when I told him there were 350 cards in the first series, and he was a little frustrated that the "cards with the weird numbers" weren't going to help him complete his set. Still, I'll encourage this as much as I can and if we get close enough to a complete set I'll post his want list here. I was waiting to read this post until I bought a pack or two and could see the cards myself. 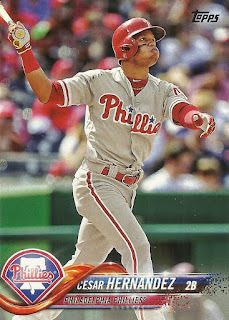 I finally bought three with my son a couple days ago at Target and our first Phillie was...also Cesar Hernandez. Anyway, my son liked the cards, but I looked at them and the lack of any sort of frame around them and thought “Stadium Club”. 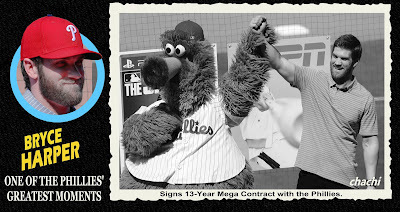 I will no doubt buy all the base set Phillies cards and also the full boxed set later in the year, but I suspect my real collecting will be the Archives and Heritage sets this year. Completely agree with you on focusing on Heritage this year. 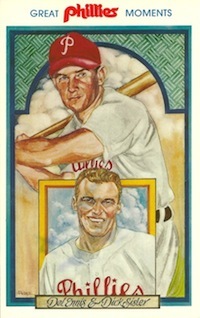 My son actually asked me today, "Doesn't Topps realize that people like the 'old' designs more than the 'new' designs?"